In an effort to reduce barn fires, one farm insurance company is offering free inspections to its members. Ontario-based Farm Mutual Reinsurance Plan (FMRP) made the announcement in last month’s Ontario Hog Farmer journal, stating that the company – which has 52 member companies across Canada – has been involved in farm building loss claims of $5 million since the beginning of the year. The decimated facilities include barns housing pigs, horses, dairy cows and goats. Inspectors from the insurance company are available to inspect farm buildings and provide a risk assessment report to all members. The report is predominantly based on thermal imaging of electrical systems, which detect any increase in temperature inside electrical and mechanical systems, indicating a problem that could potentially cause a fire. 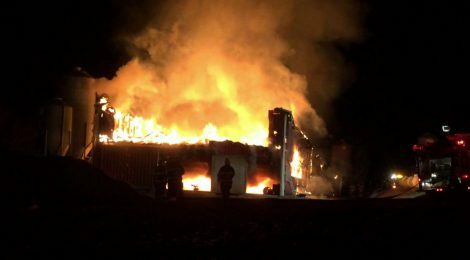 The company reports that 80% of barn fires are attributed to electrical system failures, often due to a lack of maintenance or rodent damage. The company also reports that 70% of its farm inspections have revealed electrical anomalies. Modern pig production facilities are particularly damaging to electrical equipment as the toxic environment from high ammonia levels corrodes wires. While the company is simply offering the free service at this point, given the massive casualties and the horrific deaths endured, we urge FMRP to make inspections mandatory and recommend other insurance companies do the same.